There are a lot of things about golf that make it FUN; the company is (almost) always good - no one is introduced to golf by people they don’t like; it’s a gift that friends and family share with each other. While many fun things in modern day society are about going faster, playing golf provides a welcome sanctuary from the 'instant' culture we now live. People (usually) enjoy being out there and are in no rush to leave. It’s a nice place to be. At the heart of it all is the strangely compelling allure of making that ball go from here to there. At first just moving it is a triumph. The next goal is to make it fly high, then far. Eventually the hope is to make it go more or less straight. A (lucky) few get to a point where they can make the ball curve left or right at will depending on the situation. They can play high shots, low shots, 'cuts' and 'hooks'. They can GET IT IN THE HOLE (which is the point). For them, playing is fun (it has to be or why do it?) but they also find something more in the game. It offers a challenge. For them the fun is not just moving the ball, it’s moving the ball how they want, when they want. There is a certain thrill about putting yourself in a situation where you have to make a shot at a given moment. It's about competition. It’s about learning how good you can be by finding your limits and breaking through them. Serious Golfers are Visionaries. Golf gives them a way to actualise their dreams. From Jack Nicklaus to Tiger Woods, Nancy Lopez to Annika Sorenstam, golf has been sustained by young imaginations that fall in love with the sense of power & control that comes from a solidly struck shot and the sense of accomplishment that comes from achieving a personal best score on a hole. It makes them want to do it again, and again until the sun sets. Then they're back the next morning, feeding an unquenchable passion. Golf is meant to be FUN. It's a time for friendship, laughter, disappointment and glory. For people who get bitten by the bug, the game means a touch more. They practice a little longer, watch the big tournaments with more interest and immerse themselves in the nuances, subtleties and disciplines of the game that date back centuries. They don’t idolise their heroes on the European, PGA or LPGA Tours; they want to BE them. Golf is what they dream about at night and all they think about during the day. It's the tapestry on which they paint their childhood and adolescence. It shapes who they are and the person they become. The question is how to make those dreams come true. SMARD (Smart & Hard) work is an essential ingredient and PASSION is essential. Golf is game of diligence that will test the affections of even the most enthusiastic. How does a youngster harness all of these ingredients? How do they find a reliable route from the long summer days spent scuffing the dirt to being the best golfer they can be? What lessons can the pursuit of golfing excellence provide young people about being the best PERSON they can be? Becoming the best golfer you can be involves much more than swing mechanics. It involves thinking big while at the same time paying attention to the small details that allow big things to happen. BIG dreams precede great accomplishments. However, the reality is that dreams of a career in Professional golf are just that. Even playing University/College golf at a high level is something which many junior golfers aspire, but few reach. It’s a worthwhile and wholesome pursuit if undertaken wisely. The lessons learned in trying to maximise your golfing potential are applicable across the spectumn of life: how to organise time, mange expectation and to deal with success & failure when under pressure. The golfer who masters these will not only become the best golfer they can be, but also the best PERSON they can be! There are 2.5 million junior golfers in the United States alone, and there are less than 1000 men and women on the European, PGA & LPGA Tours combined! When it comes to making it big in golf, the maths in not encouraging. Dreams occur when we sleep, but in order for dreams to become reality, we need to be wide awake! Dream big, set lofty goals, but understand that setting the intention of playing on the European/PGA/LPGA Tour or even University/College golf is only a part of the process. If you establish the Vision of playing elite golf as a way to develop efficient practice habits as well as learning how to manage your time and bring similar discipline to other aspects of your life, you will be a success not only golf, but in life too! There many people involved in raising a successful golfer. From parents willing to invest time, money and energy, to friends and competitors that push them. Vital to this process is finding and working with the right Coach(es). People who can help you identify your goals and establish dexterous & elastic strategies to help you reach them. As an individual progresses in the sport, they need to understand many things; the role equipment has on their performance; the importantance of matching the clubs and balls they use with their swing characteristics. Becoming a top flight golfer requires practice; do you think carefully enough about your practice? Is it something you do for a couple of hours on a few days of the week in the summer months? The reality is that practice is oxygen for a serious golfer. It needs careful attention & planning. Proper practice habits need to be learned and refined over time. High performance golf demands as much of you mentally as physically. You can improve your mental approach every bit as much as you can your short game or putting (it can be argued that improving your short game or putting won't happen UNTIL you improve your mental approach). There are lessons to be learned here too. Just as there are lessons to be learned about how to improve your golf related fitness and nutrition habits; how to manage your time and plan your season in order to seize opportunities when they arise. Why did you want to move that white ball? What makes you want to do it again? Is it because you want to do it better? To see how good you could be? Everyone's golfing journey is different, but the further from home you get, the more important it is to stay connected to the reasons why you play. Seek good advice, know the right steps to take and above all else: KEEP IT FUN! A Harvard University Study showed that 3% of graduating students from the Class of 1953 had written down their career goals. In 1973, a team of researchers interviewed the same students from that class and found that the 3% who had written down their Goals were worth more financially than the other 97% combined. The planning process; Goal Setting for sports or in life, guide our actions and focus our energy. They provide a road to follow. A Goal is anything you choose to achieve. They are the start of dreams that come true. The key is to establish a clear and concise VISION for what you want to do with your life and or Golf. Goals can be long term (Playing on the European Tour), medium or short term (beating friends in a chipping competition on Sunday) but they have to be yours and yours alone. Goals work best when the small ones are focussed on more heavily than the big. They provide the foundation to bigger ones (e.g. the extra practice you put in to win those chipping contests might help you actually make the European Tour). People can help you reach your goals, or help you understand what your goals are, but choosing them is your job. It is YOUR life and YOU need to take control and decide what life you want to live. Goals are like road signs or a map. If you don’t know where you are going, how are you going to get there? Establish exactly where you want to go - Your Vision. Identify the journey you need to take to get there. Help you realise when you have arrived - if you ever do. Help you monitor and improve your performance. Provide motivation during slumps & injuries over the course of your career. Replace fear and tension with focus. Improve the quality of your practice and play through challenges and tasks. Achieving goals helps you develop that all important element of performance: CONFIDENCE. Not all goals are created equally. Anyone can say their goal is to make the PGA/European Tour or to play UK University or US College Golf. Procrastinating/saying isn’t DOING! Having a lofty vision/goal is a good thing only if it inspires you to take all the small steps required to become the best golfer you can be. They are the key to the long term vision, the daily habits and processes. 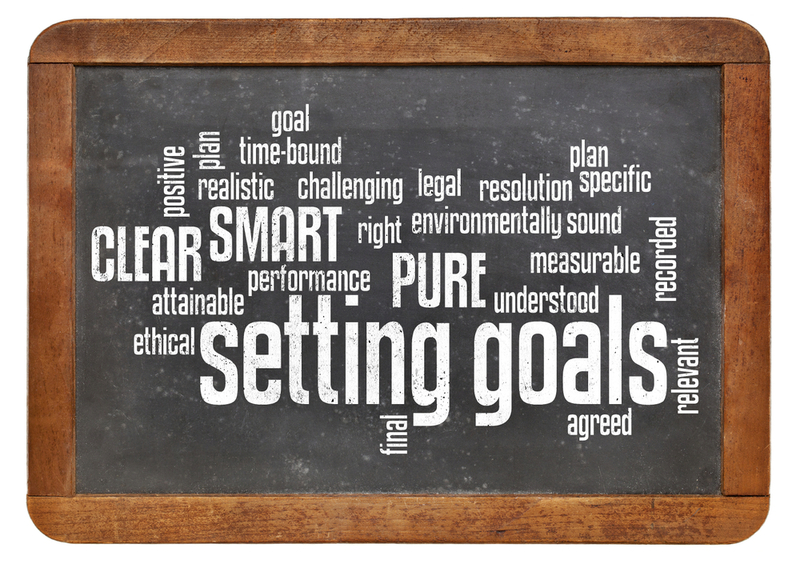 SMART GOALS is a vintage and time tested way of establishing Goals. Does it have enough detail? Is there a way to identify you have reached it? Is it tangible? If you achieve it, can you increase the intensity or is it too lofty and needs to be more realistic? Do you 100% REALLY believe you can do this? If not, deep down you wont be fully committed to it. Is there a date when you are going to measure and see if you have achieved it? “Lower my handicap from 11.5 on the 1st of February to 6.4 by the 31st of September. Specific - It states exactly what they want to achieve. Measurable - It can be calculated easily. Adjustable - It can be adjusted. Realistic - It is realistic given the skill level of the golfer (a drop from 11.5 to a 1.0 might be less realistic) and a commitment to an organised programme that includes Training, Coaching, Competition and Evaluation. Time-based - It has a specific date. Below are a couple of Worksheets to help you set some Goals and identify if they are SMART, Long, Medium or Short Term. Below outlines 5 Steps to Successful Goal Setting. These are goals that you lie in bed dreaming about. They are the ones that get you excited: setting a course record or winning a significant tournament. When Tiger Woods placed Jack Nicklaus’s career records onto his bedroom wall, he was setting the mother of all outcome goals: to become the best player in the history of the game. Your Vision (Outcome Goals) is what you hope to get out of all your hard work - the fruits of your labour. Setting them is fun. You can set them on a yearly basis or even look beyond that. I like to set 1, 3 and 5 Year Vision’s and reassess how I’m doing every 3 Months while sitting in Starbucks, enjoying a beverage (My Starbucks Moments). A concept that Thomas Plummer (the great Business Consultant and Speaker) introduced to me. However Visions require a note of caution. It’s essential to have a Vision/Outcome Goals, but they need to be kept in their place - away from the Golf course. Focussing on trying to set a course record after going four under through four holes is a great way NOT to set a course record. To play your best, you need to keep your mind clear of the result or outcome based thinking. Establish your Vision(s), then file them, allow your mind to focus on the process of achieving them. Great golfers let results happen and trust their preparation to get them where they need to go, playing each shot an island unto itself: Over prepare so you don’t under perform! Improving your driving accuracy - setting a target for the percentage of Fairways/First Cut of Rough you expect to hit on average in competition this coming season. Set a target for the percentage of greens in regulation and within that - how often you get the ball inside 15 feet of the hole (how many birdie chances you give yourself). Learn to hit the ball high/low. Learn to keep target/externally focussed on the target throughout the shot/stroke. The Step 2 Goals are examples of what someone may need to work on to reach their Vision(s). Once you’ve decided on the physical aspects of your game that you want to improve, you need to figure out how to make them happen. A key to doing this is developing a post-round debriefing strategy that allows you to objectively review aspects of your game that are letting you down. For example, if after a round you realise better Pitching from 50-70 yards would save you 2/3 shots a round you can set a Road Sign to develop a strategy/process to meet that Goal. You might have a Coaching session concentrating on the aspects of those shots, making sure your technique, mental aspects and equipment are sound. Next you would plan to practice your pitching play 3 times a week until you get up and down 5 out of 9 times every session. Each of your Road Signs/Performance Goals require similar attention to detail. Establish a Playing Focus during the round and a Tactical strategy for each hole - WRITE THEM DOWN. Use Breathing and Quick Coherence techniques to help when under pressure. React Positively or Objectively to every shot (avoid negative reactions). Focus on your Playing Focus 90% of the time during your round. Complete a post-round debrief after every round. Replace thoughts on swing mechanics with sensory based focus when competing. Life doesn’t stop for Golf - unless it is your profession ;). It’s unhealthy and counter productive if it does: “I’ll do ‘X’ later, I need to practice if I’m going to make it onto the European Tour!”. In reality, if you let other commitments pile up, not only will they suffer, your Golf will too, as life's stresses will likely leek into your Golf game. It is much wiser to take the steps necessary to balance the demands of Golf and other realities of life so that both benefit. Not as easy to quantify as hitting a certain number of Greens in a round or taking 5 shots off your handicap, there are some useful steps you can take to find the right balance between Work/School, Golf, Family, Friends, Relationships and Personal Time. Work/Golf - 65%, of their time, or about 73 hours per week. Family - 10%, or about 11 hours per week. Friends - 10%, or about 11 hours per week. Personal (reading, TV, internet) - 10%, or about 11 hours per week. Relationships - 5%, or about 6 hours per week. This is only an example and everyones life is different. As you may have gathered, if you are serious about becoming the best Golfer you can be, it’s not going to happen by accident. A diligent and Goal Orientated approach will allow you to reach your true potential.